As one of Switzerland’s largest employers in the IT industry, Swiss Post helps to design a comprehensive IT landscape. IT specialists develop Swiss Post’s sophisticated IT solutions. Swiss Post provides IT services to a range of very different industries: we place the emphasis on ensuring customer benefit and gaining a competitive edge in the financial, retail, communication and logistics markets. We combine a variety of technologies and use them to develop Swiss Post’s digital range of services on an ongoing basis. Diverse development opportunities and a friendly atmosphere encourage our teams to come up with creative solutions time and time again. Our software engineers develop sophisticated architectures and software solutions thanks to cutting-edge technology. In close collaboration with advisors, they carry out over four hundred projects each year, standardize processes and create complete sorting solutions using cutting-edge technology. Are you constantly on the lookout for the best economic and technological solutions? If so, you are just the right person to work for us as an IT specialist in our business solutions team. Work alongside our IT experts to actively influence the performance of postal operations. Our employees plan and take responsibility for projects for the provision, operation and maintenance of a Group-wide, standardized ICT infrastructure for ICT solutions. Our staff represent a central point of contact for all operational IT security requirements at Swiss Post. You too can help to give Swiss Post a competitive edge: with your ability to solve problems quickly and your commitment to the secure operation of IT systems. Our technically accomplished specialists from IT Support help solve IT problems of any kind by phone and on site throughout Switzerland. With their capacity for critical analysis and their methodical approach, their tasks include planning and implementing rollouts, procuring and installing IT workstations, operating and providing assistance for printer servers as well as being responsible for various other services. Do you enjoy helping your colleagues with IT problems? If so, join our IT Support team. 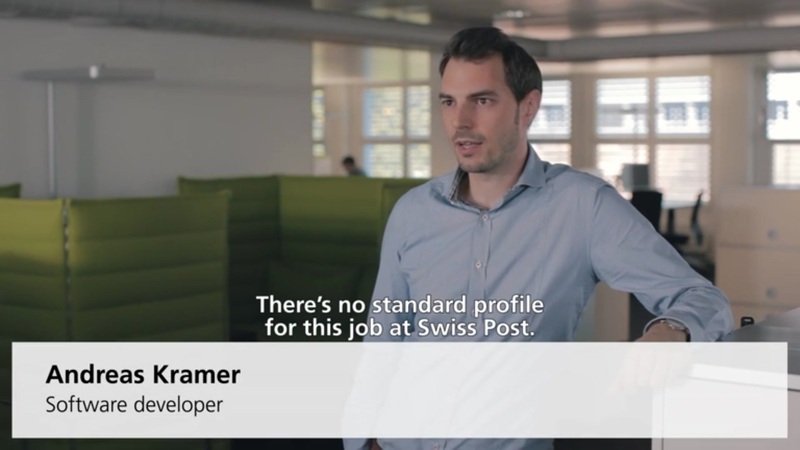 Help shape the technological future of Swiss Post. Our staff push forward the long-term development of the IT landscape by defining plans for development and targets as well as setting guidelines as they seek to achieve the set objectives. They tackle megatrends such as big data, the Internet of Things, cloud or mobile devices, and apply these developments to Swiss Post. Do you like thinking ahead about strategic matters? If so, you are just the right person to work for us as an IT architect. Do you want to discuss innovative topics with like-minded people in your IT environment over beer and pretzels and participate in interactive workshops? Then register and attend the next TechTalks@Post.